Like it or not, gadgets are expensive. To help offset the cost, many tech aficionados sell their used gear, which not only generates a nice chunk of change, but also prevents your tech from collecting dust in the closet. While there are various sites that let you trade-in and recycle your tech for cash (see our features on gadget trade-in and recycling programs for further options), Gazelle claims it's the easiest and fastest method. I tried my luck with the site to find out if their claims are true. How it works: Gazelle's website is simple and very straightforward. Type in the name of the gadget you want to sell and after taking a brief survey describing its make, model, and condition, Gazelle tells you how much cash they'll give you for your gear. If you choose to sell it, simply add the item to your cart and proceed to checkout. Gazelle will send you a prepaid USPS label, and if needed, a USPS box to pack your gadget. Payments can be made via check, PayPal, Amazon gift card (with an additional 5% bonus), or if you're feeling philanthropic, you can even have the money donated to select charities. I decided to sell my old T-Mobile HTC Wing P4350 smartphone. I received the phone at a T-Mobile press event and used it once before placing it right back inside its box. Fortunately, I had kept all of its cables and manuals so in addition to being in "perfect" condition, I also had all the original packaging. Gazelle offered to pay me $71 for it. (By comparison, the same phone had recently sold for $204.99 on eBay.) Other recycling programs like Radio Shack's Trade-In Program only offered $62.34. So I added Gazelle's $71 offer to my cart and requested a shipping box. Two business days later, my prepaid USPS shipping label and box arrived. Unfortunately, the box was too small for the phone (Gazelle didn't give me the option of choosing what size box I needed) so I had to use a box of my own. Six days later I received an update from Gazelle via e-mail stating that my HTC Wing had arrived and was being inspected. Once your gadget is given the thumbs up by Gazelle's inspectors, your payment is processed. However, if Gazelle feels that your product shows too many signs of wear and tear, they can downgrade your original quote, in which case you have the option of having Gazelle ship your item back to you for free. Should you go through with the sale, Gazelle claims payments take about a week to process. So what happens to your gear once a sale is closed? If it's too old, they gut it and sell off its innards. If the product still has some value, Gazelle resells your item on eBay. That's right, they eBay it. 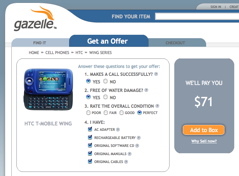 A quick look at completed eBay auctions revealed that Gazelle was indeed reselling HTC Wings for $114. In other words, they were about to make a $43 profit on my phone. Seven days after Gazelle informed me they were inspecting my phone, I got a follow-up e-mail saying it passed inspection and they would pay me the full $71. They informed me that my check would arrive in three to five days. My check arrived 7 days after their last e-mail for the full amount of $71. In all, I started the process on July 9th and got paid on August 3rd. (It would've been quicker had I chosen PayPal or had I not opted to wait for Gazelle to send me a USPS box.) So was it worth it? Not if you want to get the most money for your gear. Had the process been faster, I would've been inclined to give Gazelle another try, but the truth is I could have auctioned my phone on eBay during those three weeks and made a lot more money. However, if you have an item you think they might buy, you can submit a quick description of the item and Gazelle will tell you how much money they'll give you in exchange for it. I tried this with my ASUS R2H Ultra Mobile PC. Five days later they informed me via e-mail that they'd give me $121 for this 7" 800MHz Tablet. Again, I checked eBay and that same day the R2H sold for $247. That's $126 extra dollars that could be lining my pocket. Needless to say, I won't be selling my R2H to Gazelle. Conclusion: Gazelle makes it dead simple to trade in old tech for cash. Their buyback pricing is aggressive compared to those offered by other buyback sites (see our chart below), and if you're a frequent Amazon or Costco member, you can get an additional 5% and 2.5% more respectively per sale. However, keep in mind that Gazelle will take your used gear and sell it for a higher price on eBay where they'll generate a nice profit of which you won't see a dime. Personally, I'd look at completed eBay auctions before trying to sell my gear to Gazelle. If Gazelle's offer is slightly less than what you found on eBay, I'd probably avoid the hassle of eBay and sell it to Gazelle. However, in the case of my R2H, $126 is too much to throw away — I'd rather sell it on eBay. * The eBay price was determined by searching for recently expired auctions and taking the highest price at the time this article was written.